Fran Jurga`s Hoof Blog: News from Hoofcare + Lameness: Quality Road's Derby Withdrawal: What Did Others Do? Quality Road's Derby Withdrawal: What Did Others Do? For better or worse, quarter cracks have altered the course of horse racing history. Fortunes have been won and lost because of them. Many top breeding stallions have been plagued by them, and their progeny repeat their sires' painful steps. 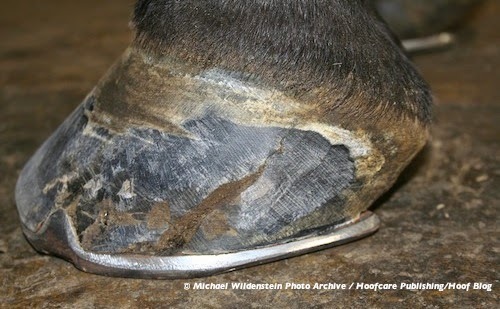 This quarter crack on a horse about to undergo treatment at Cornell University College of Veterinary Medicine is atypical in that it affects the lateral ("outside") hoof wall of a horse instead of the medial ("inside") wall. Trace the crack to the coronet and you will see that it follows a line of general stress that is not exactly parallel with the hoof angle. While most people focus on the larger part of the crack, toward the ground surface as it widens, the area of focus for judging the success of any treatment will be the barely visible origin of the crack at the hairline. Florida Derby winner Quality Road sported a new patch on his new quarter crack when he galloped on Sunday, and plans called for a serious work today (Monday) at his home track of Belmont Park in New York before shipping to Louisville for Saturday's Kentucky Derby. He stayed in his stall this morning: not a good sign. Quarter crack specialist Ian McKinlay called on Sunday to say that he was disappointed that the crack's location, right at the hairline, meant that when he inserted the drain and tightened the sutures before applying the patch, there was a tiny drop of blood at the hairline. When Monday rolled around, the stall door did not open wide. No big colt came striding out. Before you write this colt off, read your history. Today's leading sire A. P. Indy sat out both the 1992 Kentucky Derby and Preakness while recovering from a quarter crack, which popped the day before the Derby, and came back to win the much longer Belmont Stakes and Breeders Cup before entering stud. And who could forget another leading sire, Unbridled's Song, whose owner (the now infamous Ernie Paragallo, currently accused of neglecting almost 200 horses on his farm in upstate New York), sent his colt to the post in the 1996 Kentucky Derby in spite of a quarter crack and bar shoe, only to have him finish fifth. Unbridled's Song missed the Preakness and the Belmont. And don't forget one of the most underrated racehorses in American history: the great three-year-old campaign of Buckpasser, who won 14 stakes races with a gaping quarter crack that was often unpatched. The crack did keep him out of the Triple Crown, but he came back to win the Travers...and everything else. I think he won something like 14 stakes races in quick succession, within a year, in spite of his re-cracking hoof. His jockey, Braulio Baeza, said he ran on his heart, not his hooves. Buckpasser's three-year-old quarter crack was infected; the Phipps Stable brought in Standardbred quarter crack expert Joe Grasso to patch him and the crack recurred when he was four. Buckpasser is one of the most interesting horses, hoof-wise, in recent American history. The Phipps Stables is said to have tested experimental European raceplates on him. He retired with a record of 31-25-4-1. That's right: he started 31 times in three years, almost all of which were stakes races. In 1964, Northern Dancer (who looms in Quality Road's pedigree) won the Flamingo and Florida Derby prep races, as well as the Derby, while recovering from a quarter crack, but the crack would have been quite grown out by the Derby. Northern Dancer wore the vulcanized patch by Bill Bane at Santa Anita. Just to muddy this whole situation, a horse can have a quarter crack, a Quarter Crack, or a QUARTER CRACK. It sounds like Quality Road has a quarter crack, but it is in a very sensitive spot, and his decisionmakers aren't taking any chances. That translates to one less reason to hold your breath for two minutes on Saturday. Read The Hoof Blog's 2008 article on the history of quarter crack patches and horses who benefited from them. Fran, do you know why they would be using a drying agent? It was my understanding that overly dry hooves can contribute to quarter cracks and one form of treatment was keeping the hoof walls moist. So I'm a bit confused. Thanks as always for a great blog. Trying to figure out why they'd use thrush buster on a bleeding quarter crack, but what do I know? I do know a bleeding hoof is not something I'd want to mess with, as in push a horse to race with it. A pedigree correction for Quality Road. Mr Prospector does not have Northern Dancer in his pedigree. Mr. Prospector and Northern Dancer both have the Tesio-bred Nearco within two generations. Ms Prospe4ctor's Dancer ancestor is Native Dancer. Quality Road does indeed have Northern Dancer in his pedigree -- twice, once via his sire's dam line and once via his dam sire Strawberry Road, the well thought of Australian horse.